Millions of Preppers all over the world have visited The Prepper Journal to learn how to prepare for disaster, hone their survival skills and gain important knowledge that could save their lives. Since starting The Prepper Journal we have published over 1,800 articles which have been visited more than 14 million times. Our unique content is routinely picked up by some of the largest blogs in the survival and preparedness community and we are currently accepting advertising partners on our site. This is a great opportunity to put your products or services in front of millions of readers each year. If you would like to learn how we could work together to bring your products to the audience of readers of theprepperjournal.com website, please fill out the form below and we will be in touch shortly. Our metrics are tracked daily by both Google Analytics and Quantcast. 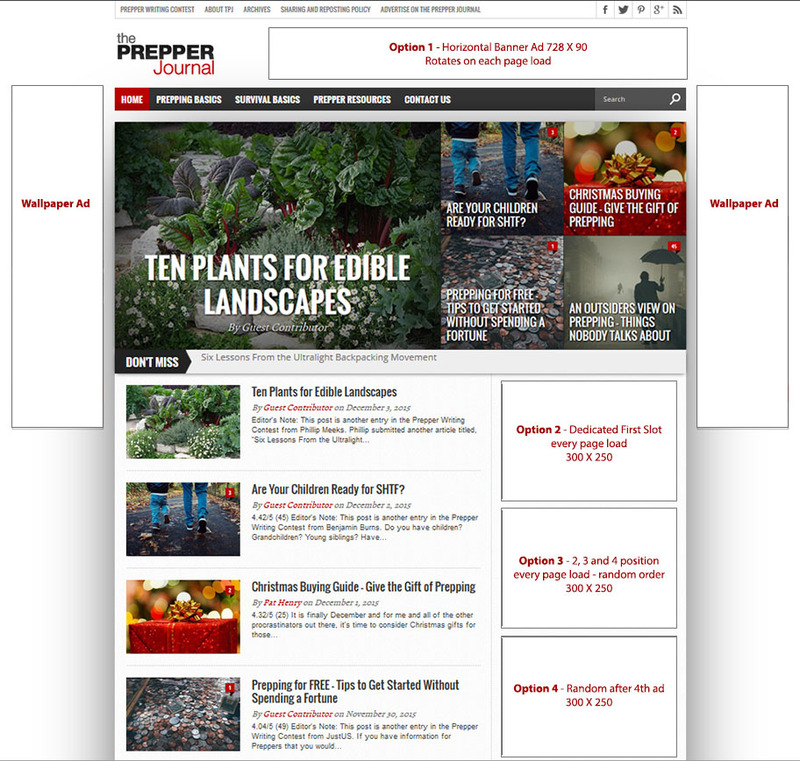 The following web page template provides a visual reference of available advertising space at theprepperjournal.com, but if you have other ideas, please use the contact form below to discuss how we might be able to work together. Advertising options for the Prepper Journal. Size: 2 160 X 600 Pixel ads on either side of the main content. Display Rules: The Wallpaper Ad gives your product or service the maximum amount of exposure to all the readers of the Prepper Journal. The Wallpaper ad appears on every single page load and doesn’t scroll off the page so it is always visible to our readers and your future customers. Graphics can be the same or different on each side. Want a custom background too? Let’s talk. Display Rules: Your advertisement will appear on 100% of the web site’s page views. Dedicated Placement Premium Ads will appear above option 3 ads on every page. Display Rules: Your advertisement will appear on 100% of the web site’s page views. Premium Ads will appear above Option 4 ads on every page. Display Rules: Your advertisement will appear on 100% of web site page views. The position will change randomly on each new page load. The Regular Side ads will appear below the Premium side ads on every page. Fill out the form below and we will send you pricing for the options we have available. Once you select the ad slot you wish to purchase, send us your ad artwork or code. We will place the ad on our site and send you a PayPal invoice for the three-month term. When your term is nearing completion we will contact you to see if you are interested in renewing. Contact Us to get started advertising today! Which Ad slot are you interested in?